CLAIMING a trick worthy of the Tardis, Octygen sample storage tubes offer a useful 475 micolitre storage volume but occupy just 60 percent of the space needed for typical 0.5ml tubes. The secret to this cleverness is the use of an external thread for the cap connection. Micronic Europe, which has just secured the exclusive worldwide rights to market Octygen tubes, says these are the first externally threaded, 2D coded, 0.5ml screw cap sample storage tubes available. 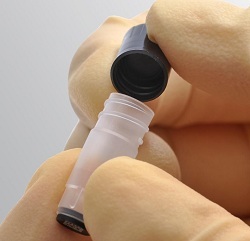 The reduced size of the tubes, which are 25.6mm high, translates into higher sample storage density and consequently reduced sample storage costs, says Micronic. Tubes are manufactured from high purity polypropylene, and each is uniquely identified with a 2D Data-Matrix code, permanently etched on by laser. They are automation-compatible and can be stored in a standard 96-well Micronic rack. Designed for both manual and automated low temperature storage, the external thread is said to optimise manual sample handling. A polypropylene cap seal minimises diffusion of vapour during storage, promising high sample integrity.